May 1971: EAC springs from a Dalhousie course called Living Ecology with the help of a government grant and several enthusiastic students. It has two goals: to convince Haligonians to recycle and to be a source of environmental information for the public. First address: a private house on Carleton St.
Nov. 1971: EAC is really in business when it moves to the dingy basement of Dalhousie University's Forrest Building, where it stays (rent-free) for 14 years. The Centre grows quickly, helped along by generous (though sporadic) government grants. Jan. 1972: EAC inaugurates a paper-recycling depot, which operates every Saturday from Jan. '72 to Feb. '75. Approximately a ton of paper is recycled each week. Recycling remains a major focus for 20 years. 1973: EAC files notice of appeal against Halifax City Council's decision to approve a massive development project on Quinpool Road. The case is lost but the project is reduced in size, thanks to EAC, local residents, and a private citizen who took the city to court. Urban development and transportation remain a major focus for EAC today. 1973: The EAC, in concert with other environmental groups and one outstanding individual, successfully opposes construction of a 12,000 megawatt nuclear power station on Stoddard Island. EAC reaches a pinnacle when it opens a (short-lived) branch plant in Port Hawkesbury, N.S. Over the next few years, EAC becomes involved in more and more high-profile public issues. March 1974: Abrupt end to core funding by government. To help provide financial stability, EAC registers as a society and obtains tax status as a charitable organization. Over the next 20+ years, however, there are several financial crises. 1975: EAC's Bring Back the Refillable Bottle campaign, which leads to changes in the Nova Scotia Beverage Container Act. 1976: EAC publishes its first book, a guide to citizen action, and inaugurates its annual Sunshine and Tarred Duck awards, given to the individuals or groups demonstrating "environmental good works" and "environmental villainy," respectively. 1976: Beginning of the fight (by many parties) vs the spruce-budworm spraying program in Cape Breton. The Centre's ability to keep the issue in the public eye helps sway the province, which in 1977 bans aerial spraying of chemical pesticides. 1976-77: EAC is a legal intervenor in the N.S. Public Utility Board hearings into the N.S. Power Corporation's proposed rate increase - just one example of the huge amount of valuable work on energy-related issues from the mid-'70s on. 1979: Adoption of EAC's logo, designed by graphic artist Zoe Lucas from a sketch of a white pine inside a circle. 1979-80: Major paper-recycling project in Fairview and Spryfield. Approx. 18% of households participate. Cancelled when a private company opens a city-wide collection service. 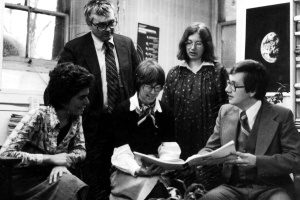 Late 1970s: EAC's public education efforts at this time include its famed lecture series, a regular newsletter (Jusun), a library specializing in energy issues (amongst other topics), school curricula development, and a high school text on environmental law, a major focus for EAC in its early years.